TS TRT Language Pandit Result 2018: Telangana State Public Service Commission (TSPSC) has conducted the Teacher Recruitment Test from 24th February to 4th March 2018. Aspirants seeking to get various posts such as Secondary Grade Teacher (SGT), Language Pandit (LPT), School Assistant (SA), and Physical Education Teacher (PET) in the state of Telangana have appeared for the TRT examination. The TSPSC has also released the answer keys for the examinations. All the aspirants have checked their TRT Preliminary Keys and estimated their probability to get success in the examination. Many of the Candidates appeared for the TSPSC TRT examination are eagerly waiting to download the results. Aspirants appeared for the TRT examination can find the result on TSPSC Official website, tspsc.gov.in. The result for SA, SGT, LPT, PET will be accessible individually. Keep checking the TSPSC official website to download the TRT Exam results, Cutoff Marks. Aspirants come across the examination can check more details from this article. The TSPSC has announced 8792 various posts including Secondary Grade Teacher (SGT), Language Pandit (LPT), School Assistant (SA), and Physical Education Teacher (PET) posts recently. The recruitment of suitable candidates will be done through Teacher Recruitment Test (TRT). Candidates those have qualified in the examination will be appointed in Govt, Mandal Parishad Schools, Zilla Parishad, and Schools Under the control of the Tribal Welfare Department and Municipalities in the Telangana State. District Selection Committee (DSC), Telangana is going to appoint the selected aspirants in various schools for the announced posts of SGT, LPT, SA, and PRT posts. Candidates who have appeared the Teacher Recruitment Test in the state of Telangana can check their results shortly. The TSPSC is soon expected to release the TRT result in the month of March (tentatively). Hence candidates can keep visiting the TSPSC official website, tspsc.gov.in to find the exact date of result. Telangana PSC Will Release TRT Results name Wise and Hall Ticket Number wise along with Selected candidates list for Further test. Stay Tuned here for Release Date news and final answer key details. TRT – Physical Education Teachers (56/2017) Telugu. TRT – Physical Education Teachers (56/2017) English. TSPSC ha conducted written examination for recruitment to the post of Secondary Grade Teacher, vide notification 53/2017, on 25/02/2018 FN & AN and on 02/03/2018 FN. The Merit Lists of 8 mediums in this notification are prepared and are made available in the Commission’s Website, the details of which are as follows from official website here SGT Results , Otherwise download from below due to server issues we have uploaded in the given links. Ranking list of TRT for the post of Secondary Grade Teacher – ENGLISH. Ranking list of TRT for the post of Secondary Grade Teacher – BENGALI. Ranking list of TRT for the post of Secondary Grade Teacher – HINDI. Ranking list of TRT for the post of Secondary Grade Teacher – TAMIL. Ranking list of TRT for the post of Secondary Grade Teacher – URDU. The candidates who are rejected due to incorrect bubbling of HT No. Booklet series etc., are not included in the Merit List. The candidates who approached court and are admitted as per the court orders are included in the Merit Lists. The ranking Candidature of the candidates who approached Hon’ble High Court and obtained interim orders to allow them for further process is purely provisional and subject to outcome of the final judgments in the respective W.PsW.As pending before the High Court. TRT-SCHOOL ASSISTANT (52/2017) – Subject-wise Ranking Lists. How To Check TS TRT Results 2018, Merit List Online ? 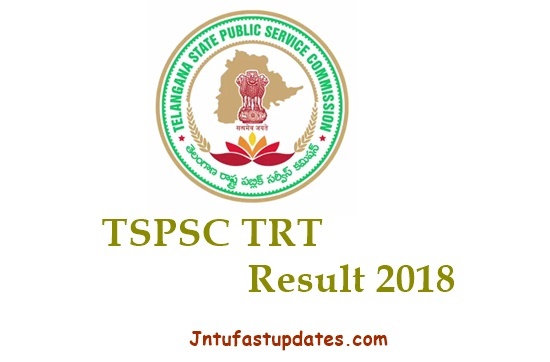 Search for TSPSC TRT 2018 Result link on the home page and then click it. 1.5 How To Check TS TRT Results 2018, Merit List Online ? sgt certifecate verifecation dates ? I kindly request the admin to answer the queries . What is this 1:3 ratio list of School assistant post all about ? My Hallticket no. Is present in the merit list in 700 hundreds bt its not present in 1:3 ratio list of the candidates selected for the verification of certificate. ? What does it means? What is this 1:3 ratio list ? They have shortlisted 4589 candidates list bt only 129 candidates r selected in 1:3 list. What is the actual procedure . M in dilemma? They have even issued 1:3 ratio list of selected candidates fr verification of the certificates. What does it means? In the merit list my hallticket no. Is present in 700hundreds bt its not present in the 1:3 ratio. On wht basis r those candidates selected then ? What about lp hindi results? where the heck can I download merit list of TS TRT SGT candidates.. why can't you provide a direct link to see the list ? ?